Swansea City could recall Jazz Richards or Stephen Kingsley from their loans at Fulham and Yeovil respectively to ease their defensive worries. The Swans are without suspended left-back Neil Taylor for Saturday's trip to Leicester, while injured Kyle Naughton is out for the season. As Dwight Tiendalli cannot be recalled from his loan at Middlesbrough, Angel Rangel is the only available full-back. Striker Bafetimbi Gomis is awaiting the result of a hamstring scan. "Hopefully it's not too serious because we're very thin on the ground as it is," said manager Garry Monk. Nelson Oliveira missed the game against Everton with a foot injury, and it is unclear if the striker on loan from Benfica will be fit enough to face Leicester. If Gomis's hamstring injury rules him out, Marvin Emnes could be the only recognised forward available. Swansea face another problem at left-back, with Taylor banned for two matches after receiving his 10th yellow card of the season against Everton. 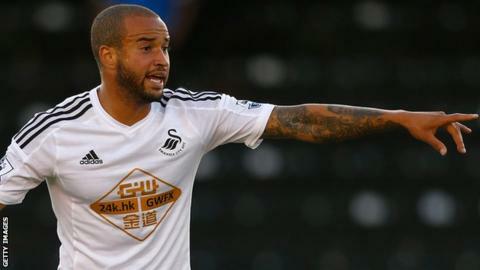 Naughton's season-ending ankle injury leaves right-back Rangel as the only fit full-back in the squad. Richards joined Fulham in January and missed Friday's draw against Wigan through injury, but is expected to return to training this week. The 24-year-old Wales international could now be recalled by Swansea, who are also considering taking Kingsley, 20, back from Yeovil, who have already been relegated from League One. Monk added: "We will miss Neil. It's an area we needed to strengthen, so we don't have the greatest cover in that position, but I'm sure we'll come up with something."